Page one: Introduction, Trafalgar Square, National Gallery, St. Martin in the Fields. Page two: Admiralty Arch, Horse Guards, Banqueting House. 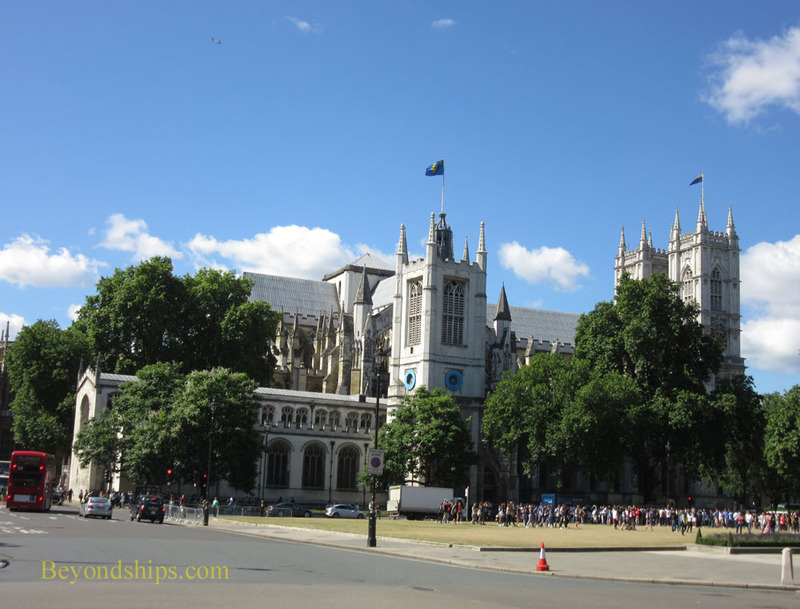 On the south side of Parliament Square is one of the most popular attractions in London, Westminster Abbey. Famed as the site of coronations, royal weddings and as the burial site of numerous famous people, this cathedral-like church attracts over one million visitors each year. There have been religious buildings on this site going back into the mists of time. However, the real story of Westminster Abbey begins around 1040 when King Edward the Confessor, who was later canonized, decided to greatly transform the small Benedictine monastery that was sited here. This included constructing a large stone church. It became known as the “West Minster” to distinguish it from St. Paul's Cathedral, the large church to the east in the City of London, which was referred to as the “East Minister.” Over time, the name became corrupted into Westminster and the surrounding area took on that name. After the Norman Conquest in 1066, William the Conqueror was crowned king of England in the Abbey. This began a tradition and every coronation since then has been in the Abbey. Sixteen royal weddings have taken place in the Abbey including the marriage of Prince William to Kate Middleton. Most of the present Abbey dates from 1245, when Henry III decided to re-build the church in what was then the new Gothic style. Various additions have been made over the centuries including the towers, which were designed by Nicholas Hawksmoor in the 17th century. Although universally referred to as “The Abbey,” this church has not been an abbey for nearly 500 years. When Henry VIII dissolved the monasteries in the 16th century, the Abbey became a cathedral church with a bishop. However, it soon lost its status as a cathedral. 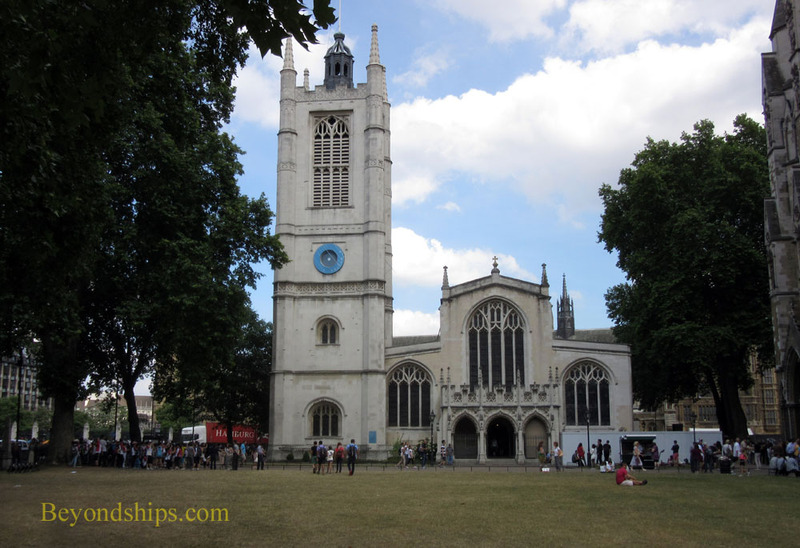 Since the reign of Elizabeth I, the Collegiate Church of St. Peter, Westminster, as the Abbey is officially called, has been neither a cathedral or a parish church but rather a Royal Peculiar. It is subject only to the Sovereign and not under the jurisdiction of any archbishop or bishop. Over 3,000 people are buried in Westminster Abbey. Kings and queens, including St. Edward the Confessor and Elizabeth I; poets and writers, including Geoffrey Chaucer and Charles Dickens; scientists, including Sir Issac Newton and Charles Darwin; as well as other national figures such as Victorian Prime Minster William Gladstone, rest here. The grave of the Unknown Warrior near the West Door is a focus of great national respect. The Abbey also contains memorials to many other important people who are not buried here. Examples include Winston Churchill, Sir Francis Drake, Lord Byron and William Shakespeare. Essentially, a memorial can be found to every famous figure who made an important contribution to British history. With its soaring Gothic pillars leading up to a distant ceiling, the interior of the Abbey is impressive. Medieval wall paintings, the intricate inlaid pavement in front of the high alter and numerous statues on the graves and memorials are among the artistic highlights. Most of the stained glass is 19th century or later. 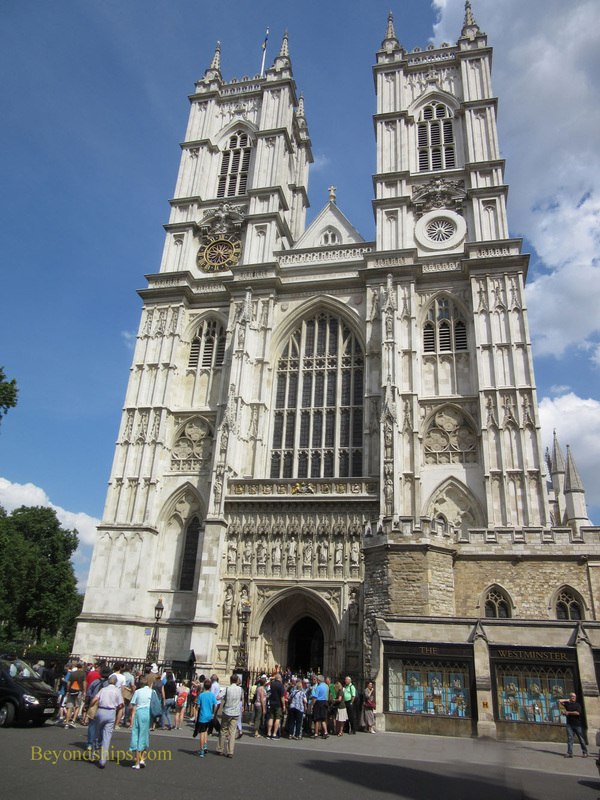 Westminster Abbey is usually open to visitors Monday through Saturday. On Sundays and religious holidays, it is only open for worship. Guided tours led by one of the vergers are offered for an additional fee beyond the entrance charge. For more information on visiting, see the Abbey's website. Immediately adjacent to the Abbey is another church. St. Margret's Church looks small by comparison but is in fact a substantial building. The Abbey has had such a companion church since the 11th century. It was built so that the monks carrying out their offices in the Abbey would not be disturbed by people coming to hear mass. The present structure dates from the 15th century. Known as the “parish church of the House of Commons,” at the end of both World Wars, the prime minister led the House of Commons to St. Margret's for thanksgiving services. St. Margret's has also been the site of the weddings of some notable political figures including Winston Churchill and Harold MacMillan. Sir Walter Raleigh and the poet John Milton were buried inside the church. The grassy area in front of St. Margret's where one often sees tourists walking or sitting is, in fact, a graveyard. Until 2009, the highest court in the U.K. was the Appellate Committee of the House of Lords. In that year, Parliament created a separate Supreme Court with appellate jurisdiction over civil cases in the whole of the United Kingdom and jurisdiction over criminal appeals in England, Wales and Northern Ireland. Like the United States Supreme Court, the U.K. Supreme Court concentrates on disputed legal questions of great public importance. Most cases coming to the Court have already been heard by an intermediate appellate court and thus the issues presented have been developed and sharpened for decision. The 12 justices of the Supreme Court sit in the former Middlesex Guildhall. Located on the western side of Parliament Square, this neo-Gothic building was designed by James Gibson. It was originally the home of Middlesex County Council and Quarter Sessions. 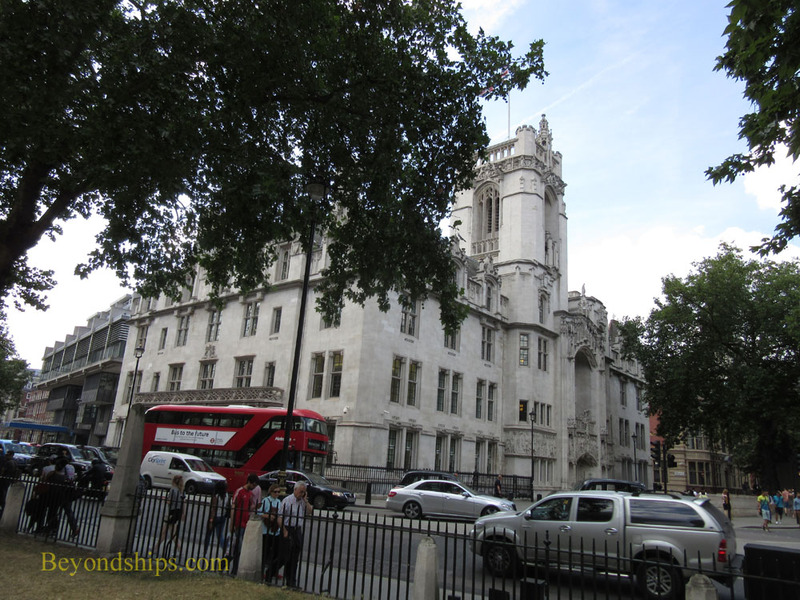 In 1964, the building became a Crown court. It was restored and refurbished before the Supreme Court took up residence. The Supreme Court is open to the public and visitors can watch cases being argued. Bear in mind that the Supreme Court is not a trial court and so it does not take the testimony of witnesses or hear cross-examination. The arguments consist of lawyers and judges discussing questions of law. Guided tours are also available. They take participants into the courtrooms and some areas not normally open to the public such as the Court's library. For information on visiting, see the Supreme Court's website.